You’re shopping with Anne Lehwood. Close To My Heart is partnered with Operation Smile™, an organization that provides free, life-changing surgery that repairs smiles and reshapes lives, one child at a time. Since 2008, Close To My Heart has provided support to change the lives of over 1,500 children and their families. Buy with pride. Your business with Close To My Heart makes a big difference in the life of a child. 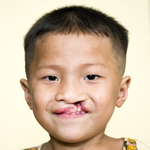 By chance, Ming’s mother found an Operation Smile™ flyer advertising the November 2007 mission in Cambodia. Ming and his grandmother traveled five hours in an overcrowded taxi from Odong Mein Chey province to the Khmer-Soviet Hospital in Phnom Penh to be considered for surgery. Before his operation, Ming didn’t want to go to school because the neighborhood children were scared of him and would not let him play with them. 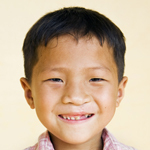 Now that his mouth and nose are corrected, Ming looks forward to school. With these amazing results, he is now a lively and confident kid. Looking for more ways to contribute to Operation Smile™ through Close To My Heart? Wear one of our Operation Smile t-shirts with pride, knowing that $5 of every t-shirt purchase is donated toward Operation Smile. These t-shirts are exclusive to Close To My Heart, and represent the company’s mission to celebrate life and share what matters. Show your support for Operation smile and order yours today! Your donation will help change the lives of children all over the world, one smile at a time.